2018 was a great year for AusLaw firms*! The question I have though is this: is this a true correction? have the underlying structural changes that we all know need to be made been put in place? if so, are we starting to see the benefits of these, or does this chart represent a false dawn? And as we entered 2019 I’m going to leave those two questions out there, as I think many of us know what the real answers are here. As always, would be interested in your views. I was fortunate enough to have recently been invited by Ian Mountford, of Fit for Social, to join him in a general discussion on our mutual thoughts around how well #Auslaw firms are doing with their use of social media as a business development tool. Chat lasts about half and hour and can be heard here. For those of you who listen, hope you enjoy it. As usual, feel free to let me know whether you agree or disagree with my views. According to a post by Casey Sullivan of Bloomberg, earlier this week US law firm Crowell & Moring announced that it would increase its billable hour requirement for associates, from 1,900 hours per year to 2,000 per year. This new target will take effect 1 September 2016, but on the plus side 50 pro bono hours will count as billable. 15 Years ago I would have cried out “all kudos to you”. Back then my yearly billable target for an English ‘Magic Circle’ firm was 1,400 hours and I flogged my guts out to achieve that. So if you can effectively put 50% of billables on top of what I was doing (and trust me when I say I wasn’t going home at least one day a week), then you’re a better person than I (or so I would have said then). But if you really need validation of what asking someone to work 2,000 billable hours a year means, then I would like to recommend you read “The Truth about the Billable Hour” by no less an institution than Yale University. In that publication, Yale caution aspiring lawyers that if you are being asked to “bill” 2201 hour, you need to be “at work” (includes travel time and lunch, etc.) 3058. Taking that further, from an Australian law perspective, if you are being asked to bill 2,000 hours a year then you need to bill 8.3 hours a day (assuming a 48 week year and you never get sick; which, if you are being asked to do this, you most likely will be). That means you are very likely going to need to be “in the office” around 12 hours a day – and that assumes no write-off by your partner or leakage. Exactly right, you’re measuring all the wrong things! And for those who may point out the benefits of this including 50 hours pro bono I say this: the Australian Pro Bono Centre National Pro Bono ‘Aspirational Target’ (ie, where we would like to get to), is 35 hours per lawyer per year. – if you ask someone to do this, then you really leave them very little time to do anything else. This really should be a concern, on the business front because you leave almost no time whatsoever to train them in the business of law – ie, you kill any entrepreneurial spirit they may have. And, crucially, the only metric that really counts to them is that all important 2,000 billable hours (keep in mind that like I was, they’re very young). Which for a profession that has the mental health issues we do, is not good. For all of these reasons, I’m hoping no other law firm follows this. But sadly I think they will. Oh, and if you are a law firm client reading this post you might just want to look up whether your local jurisdiction has a “Lemon Law” rule that applies to provision of a service. Last week the USA’s J Johnson Executive Search, Inc and the UK’s Totum published their combined ‘RFP Survey Responses: U.S. and U.K. Data 2016‘. A fairly evenly distributed demographic of large (defined as being 600+ lawyers), mid-sized (defined as being 100-600 lawyers) and small (up to 100 lawyers, for the U.S. only) law firm respondents, insights from the survey include time spent responding to RFPs, persons within firms charged with project managing responses, as well as tools and expertise made available to responding teams, in both the U.S. and the U.K.
As with most surveys of this nature however, it is the role that pricing plays that typically grabs my attention and given this survey’s combined U.S. and U.K. perspective even more so in this case. 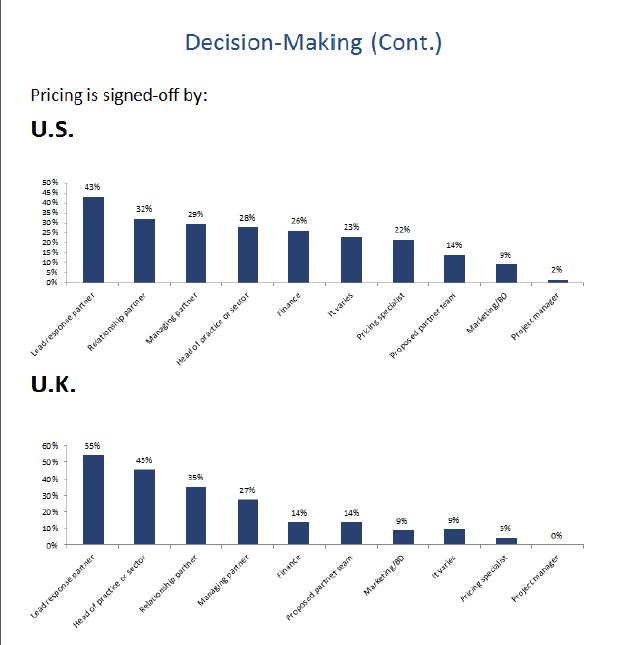 Given ongoing market pressures, it should surprise no one that responses of “strong” from the U.S. (58%) and the U.K. (64%) to the question of what current “price pressure” for proposal & RFPs were fairly similar. 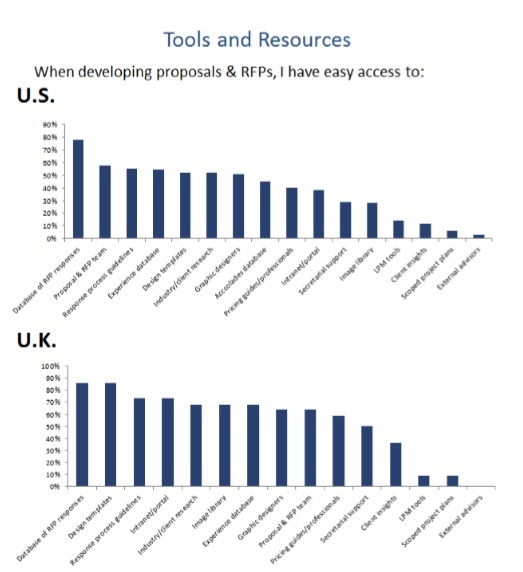 A little more surprising to me was the difference in responses between the U.S. (40%) and the U.K. (60%) to the question “when developing proposals and RFPs, I have easy access to” the answer was “pricing guides/professionals“. Now don’t get me wrong, even these days I think it is particularly progressive and somewhat comforting to know that 60% of my colleagues in the U.K. have access to some sort of “pricing guide/professional”. Until, that is, you get to see who actually gets to sign-off (i.e., the “decision maker”) on the all important issue of pricing in RFPs in the U.K.. Here, and I kid you not, the response in the U.K. of “pricing specialist” (that same person who 60% claim to have some form of access to – either via guides or in person) was 5%. I think that is worth repeating – 5%. Put into context, that means in the U.K. pricing in your RFP is more likely to be signed off by Marketing & BD (9%) or Finance (14%). Indeed, in the U.K., “It varies” is likely to have more of a say on final pricing in the RFP response than the so-called pricing specialist. I’m not so sure why the results of this particular survey so surprise me. After all, time and time again survey results show that we typically say one thing about pricing, but do quite another. What I will say though is this: if you have access to a pricing specialist, and pricing by your pricing specialist is being determined in 5% or less of your RFP responses, my guess is going to be one of two things: (a) you have no idea if you are making money from your RFP “wins”, or (b) more likely, you are leaving money on the table big time! * images should be enlargeable, apologies if they appear a little blurred. “A value group is simply a group of influential business professionals (e.g. CFOs of major corporations or office managers of the top five consulting firms across the country, etc.) who meet either quarterly, or three times a year and share a common interest. Really useful tip by Carla that I thought I would pass on to you. Make sure you read the rest of Carla’s post and if you would like to get updates on other business development and marketing related material I read each week, feel free to sign up to my free weekly Mail Chimp update (or email me if you want to be added to the subscriber list). How long before we see a ‘Red Team’ service in #Auslaw? Sounds very similar to the sort of lawyer placement service we are seeing from the likes of Crowd & Co here in Australia, only in this case the target market is specifically support services. 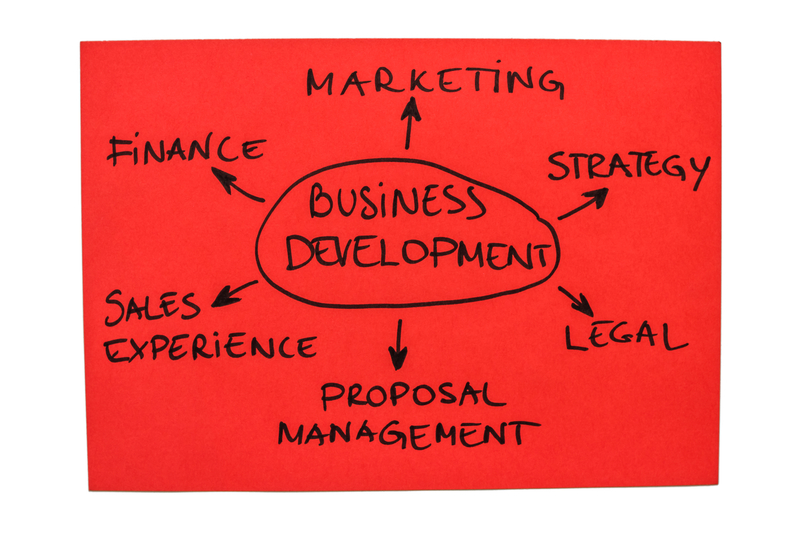 I have to say that outsourcing back office services such as marketing and business development was something I saw becoming popular in Asia during the Asian Financial Crisis in late 1998 and I have often wondered when we would see such a move take hold in the West. Today may just be that day. Two things got my attention on Friday. The first was the decision by the UK to exit the EU (so-called “independence Day” by some of the more fanciful politicians and “Brexit” to most of the rest of us). On a much smaller scale, the second was an article in The Australia Financial Review that “Ditching the billable hours case a struggle“. (print edition – NB: online the article title is “Billable hours to always hold a place in law firms“). With the first of these two items, I have very little to no control over and am left at the mercy of others. The second on the other hand is absolute rubbish! To be clear, mention of the billable hour in the opening four (4) paragraphs of this article are all to internal metrics; specifically how many hours fee earners need to bill each day to make budget (and a side note here, anyone else note how this changed from an annual figure of 1,400 hours to a daily figure of between 6 and 7.5 hours depending on which firm you work for? Is this because a daily figure is much easier to live with than an annual figure that daunts you by its task? If so, kind of simplistic thinking towards people who are supposed to be in the top 1%). That squiggly little line in free-fall tells you realization rates have fallen from roughly 93 cents in the dollar in 2005 to just over 83 cents in the dollar in late 2015. It also tells me that you are not doing a very good job if you are working with your clients vis-a-vis how you charge them for the work you do and it puts to rest any attempt to suggest that billable hours are the preferred method of clients to be billed (unless, that is, you’re suggesting that clients know they can get discounts, or just not pay, bills that accrue on an hourly basis). So over the weekend I got to think: like the article says, pretty much all of the reasons why the billable hour continues to be a struggle to ditch are down to internal measurement metrics. So, maybe, just maybe, like the UK did on Friday, it’s time for Australian law firms to opt out of the known and disruptive itself – and maybe the rest of the world with it! Report: 45% of Australian GCs are forecasting a decrease in their 2019 legal spend – How is this going to be achieved? Want to know how Microsoft’s legal team measure value? Is your law firm building a community or servicing a customer? Question:- Is your firm pricing the issue or the risk?